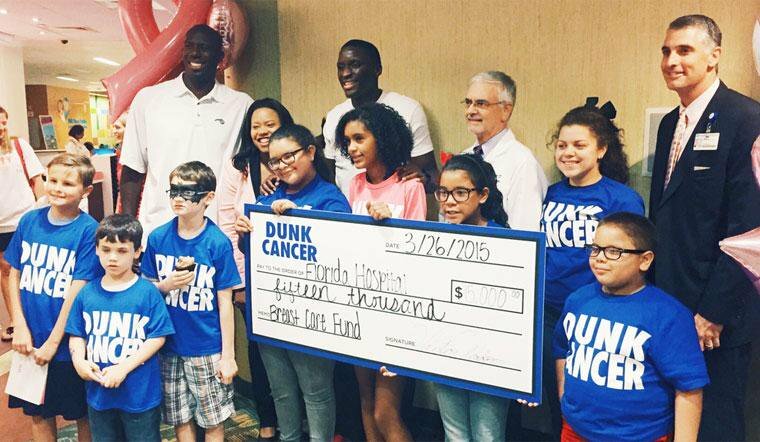 In Fall of 2012, Victor Oladipo and Jay Henderson founded Dunk Cancer – a 501(c)(3) organization focused on funding cancer research and initiatives directed at improving the lives of the youth that are affected by cancer. All-Star NBA phenom Victor Oladipo has long been devoted to promoting healthy choices and to giving back, but it was after unexpectedly losing his junior high school basketball coach that he realized his passion to make a difference specifically for cancer prevention. Since 2012, Oladipo and Dunk Cancer, have brought a charitable initiative that brings the basketball community together in order to help individuals and families affected by cancer, overcome their present battles, and also to support the research for finding a cure. After gaining 2nd place at the NBA Slam Dunk Contest in 2015, Oladipo donated his $15,000 in winnings to the Florida Hospital Cancer Institute to combat breast cancer. Dunk Cancer has just hosted its 3rd Annual Thanksgiving charity event in a partnership with Dave & Busters Orlando helping over 100 families. Dunk Cancer also gifted 50 underprivileged kids from the Central Florida Boys and Girls Club with Christmas presents last year in a partnership with Toys R Us and Dave & Busters Orlando as well. In 2018, Victor partnered with Anthem Foundation to donate $1,000 per dunk (and not less than $100,000) to cancer research nationally. In addition to Victor Oladipo, Dunk Cancer has plans on great strategic partnerships with other celebrities and athletes as well as amazing companies, further expanding its impact and reach. This is just a snapshot of the community involvement Dunk Cancer prides itself on and will continue an even greater legacy of giving back moving forward!